We invite you to join us on April 17 from 6:30 to 8:30 to view art and write letters of encouragement to the prison artists! Prisoner Express is one of the library’s longest-running programs. 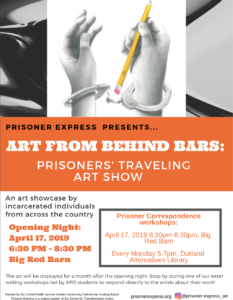 Its annual prisoner art exhibit, Art from Behind Bars, features the work of incarcerated individuals and will be held from April 17 to May 5 at the Big Red Barn. The art is representative of prisoners who participate in PE’s distance learning program which provides academic and creative projects to 4500 prisoners throughout the United States. The show at the Big Red Barn launches a traveling exhibition that will be presented over the next year at different venues throughout the Finger Lakes region. This provides an opportunity for the larger community beyond Cornell to see the artwork of prisoners. Please join us for Opening Night, this Wednesday, April 17 from 6:30 to 8:30. Enjoy art, community, and the opportunity to write letters to the artists whose work is on display. Paper and envelopes will be provided and we will mail the letters to the prison artists. First names are used and the return address is Durland Alternatives Library. The human need for acknowledgment is often denied to prisoners and your comments and your letters provide meaningful support. We’ve teamed up with Cornell Crowdfunding to raise awareness and support for this perfect example of how libraries cultivate social justice. We invite you to take a look, give, and share our mission.